We are a Physiotherapist and a General Practitioner who qualified in 1993 and 1999 respectively. We have a combined clinical experience of over 40 years working in a wide variety of settings with the general public. The basic principle behind this book is self-management. It presented itself to us whilst we were discussing and comparing our own experiences as clinicians. During our work, we realised that we encountered a wide variety of complex physical, psychological and social problems, and were often giving similar patterns of advice to our patients. What varied was the detail, but the principles of strategy were common to each problem. The idea slowly took shape over many years of interacting with patients in clinic. Invariably their needs were complex. Often the issue that they felt was troubling them was actually clouded by another. When patients attend for physiotherapy, one of the most common problems they present with is pain. We noticed when taking the time to listen to our patients that the pain was much easier to bear when additional aspects of the situation were addressed, e.g. increased understanding of important family members, practical solutions to mobility problems, etc. Once we had identified what was similar in each of the management strategies we had helped patients to create, we then began to apply it to other situations, those presented to us by patients and those in our own lives too. It was during this process that we realised that we could adapt our model of “Five Points of Rescue” to any situation that either of us brought to the table. This included a full spectrum of problems from the simplest, to the darkest and most complicated scenarios. In the beginning, as clinicians, we were intuitively assisting people in formulating solutions to their problems. It is in our nature and training to do so. Over time and with experience and study of the process, the Five-Point Rescue Plan began to emerge. The process continues to evolve to this day. Through regular interaction with people, facilitating their formulation of a Five-Point Rescue Plan, we find that they continually contribute to the strategy and our understanding of it. As patients are actively involved, they have helped with the development of the strategy. In fact the term “rescue points” was actually coined by a patient with low back pain who had been asked, during a recurrence of her pain, to go back to her plan and look at her points. When dealing with problems, people are usually advised to develop coping strategies to help. However, people are rarely offered any practical advice on how to do so. Some turn to unhealthy options such as drugs and alcohol. Externally, and with hindsight, it is easy to see that certain coping mechanisms are destructive and can even become a problem in their own right. People cope the best way that they can but often get stuck in their situation, and it becomes difficult to see the light at the end of the tunnel. In writing this book, we aim to give you the skills to work through your set of issues identifying which factors you can change, and which you cannot. We will help you develop your own appropriate coping strategies. This will empower you and allow you to become independent of other people and of any emotional crutch. You may have been bombarded with advice, information and sometimes pills and potions. Some of these may help, but often not. The reason for this is simple – the person giving the advice is not you! Nobody but you can truly understand the details of your predicament or the ultimate effect of it on you and those around you. The treatments you are offered are studied and devised by panels of experts, but they are generalised, not specific to you. You, on the other hand, are an expert on you! Your view of the world is unique. You have specific likes and dislikes, a set of values instilled from childhood. You have learned throughout your life from a series of experiences that are totally individual to you. It is critical that this view, your view, is at the foundation of any management plan. If not, then the plan is unlikely to succeed because you are not invested in it and have no real responsibility to make it work. 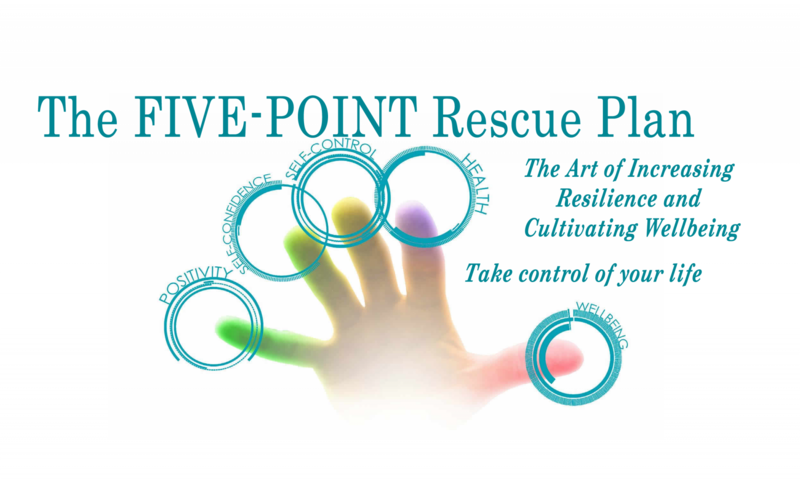 The Five-Point Rescue Plan is all about you. It puts the responsibility back where it belongs, in the hands of the only person who can really do anything about your situation, which, of course, is you. Many people feel they cannot help themselves and become so tangled up in their situation that it is hard to see any way out. With this book we are going to bridge the gap between you and the Healthcare Professionals, combining your expertise with theirs. This will allow you to take control of your situation rather than sit on the side-lines as a spectator. Gaining control is very empowering and has a positive effect on your mental health. Research shows, and we all know from our own experiences, that mental and physical health are intrinsically linked (Miller, 1992). Simply put; if the physical health improves, so does the mental health and vice versa. Learn to use this book, and we guarantee benefits to both. Whether you are dealing with an ongoing problem or a sudden, unexpected crisis, there is usually no individual solution that will ease you out of your situation. Often people put all their hope in one single answer believing it to be their salvation. This invariably leads to a succession of failures and disappointments, compounding the problem. Patients have approached us because they wish to try acupuncture for their pain. This has often come about because the patient has tried everything else, or someone they know has experienced miraculous relief. They come in the hope that this will be their salvation. It is very rare, in a clinic where we look at our patients holistically, that we will give just acupuncture. What has been seen to work in these situations is the whole process. This includes a thorough assessment, counselling, postural advice, appropriate physical techniques, exercises, and acupuncture. The combination of treatments has had the positive effect not just one. We have known patients to request a particular course of treatment which was, on assessment, found to be unsuitable for them and could not be given; after a Five-Point Rescue Plan was put in place, those patients were no longer looking for a miracle cure. From our many years of clinical experience, we have discovered two things. Firstly, you must focus on what you can change rather than what limits you. Secondly, it is the implementation of a prescribed combination of strategies that work to help you solve your problems. It is important to remember, however, that making massive changes is not sensible or sustainable. Radical changes in habit are hard to maintain because they are unfamiliar to us. They may be relatively easy to apply at first, whilst the motivation to change is at its greatest, but if success is not achieved quickly, we often revert back to our previous more comfortable habits. Lindsey had put on weight after having children and was very unhappy about this. She had tried diet after diet to no avail. Each time a new technique became popular, she gave it a go and stuck to the rules of the diet religiously for the first two weeks. Initially, she would see positive results then invariably something would happen in her busy life that meant she couldn’t follow the plan. The weight loss, of course, faltered. This left her feeling low and ashamed of herself, which led to comfort eating, thereby, compounding her problem. After talking things through, she realised the diets she followed were unrealistic given her lifestyle. Instead, via her Five-Point Rescue Plan, she established several small changes that were sustainable. This allowed her to maintain the changes for several weeks and she reached her target weight. Your Five-Point Rescue Plan will enable you to concentrate on the things you can change, and modify your current situation to create a new and more desirable one, despite your limitations. With this book, you will learn how to develop your own specific Five-Point Rescue Plan for any situation or problem that arises in your life. Your plan will allow you to develop your own bespoke coping strategies. You will be able to take control of any problem with positivity and self-confidence. Health and happiness will be in the palm of your hand. The process requires honesty, perseverance, and self-discipline; but the results are hugely gratifying. To continue with humour and humility is advised.